Opinion programs on a news network do not have to be held to the same even-handed standards that news journalists do. They deal with opinion and don’t pretend to be unbiased or completely objective. 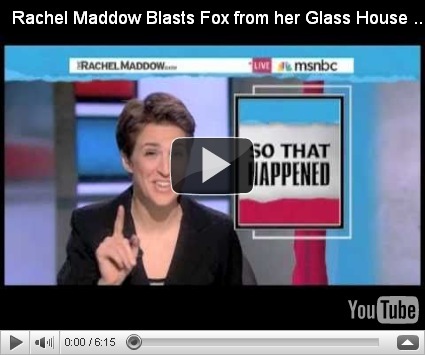 So it’s highly disingenuous for Rachel Maddow to accuse Fox News in general of being a political operation because of the publicity given to political candidates by its opinion shows, and at the same time doing the exact same thing, on her show and others at MSNBC. She tries to assert that Fox is a "political operation" and that MSNBC is not, but, as this video shows, that claim doesn’t pass the smell test. Maddow is lying to her viewers, boldly and unashamedly, on a subject that is the bedrock of a news channel’s credibility; the subject of bias. Opinion shows are biased and she knows it, but she accuses "Fox News", the network, of being a branch of the GOP.